Everybody’s gotta start somewhere. 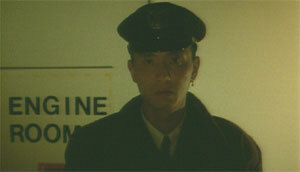 Acclaimed director Kiyoshi Kurosawa paid his dues with z-grade shlock like 1992’s straight-to-video flick, The Guard from Underground. Largely sloppy and uninvolving, this wannabe slasher flick isn’t the kind of trashy fun that it should be. Before Kiyoshi Kurosawa tackled meaty films like Cure, Bright Future, and Tokyo Sonata, he was making direct-to-video flicks as a means of getting out of director hell and into the big leagues. One of his direct-to-video works was The Guard from Underground, a thriller that owes a debt to the many Hollywood slasher films of the 1980s. While this film gives its slasher a gimmick – he’s a security guard more interested in killing people than protecting them – The Guard from Underground is a largely unremarkable entry into an already crowded genre. The plot is relatively simple: a young woman named Akiko (Makiko Kuno) gets a job advising a wealthy corporation on its acquisitions of expensive European paintings. On the same day that she joins the company, she learns about the infamous “Sumo Killer,” an ex-sumo wrestler who is being tried for murder. The guy has disappeared, and – wouldn’t you know it? – a hulking new employee has joined the firm as a security guard. Coincidence? In a better movie, the director might have flirted with the possibility for ambiguity and misdirection, but Kurosawa does no such thing. After hiding the guard in shadows for a few scenes, he eventually reveals not only his face, but his murderous capabilities. And so, within a few days of being hired, the security guard (Yutaka Matsushige) starts killing his co-workers one-by-one. He even begins to take an interest in Akiko, even going so far as to wear one of her dropped earrings as a kind of trophy. Although his brazen display of the stolen earring is more than a little creepy, it looks pretty ridiculous on the otherwise imposing mass-murderer. Of course, the remaining coworkers soon find themselves locked in the building, the lights are cut off, and the security guard starts looking for fresh victims. Who will make it to the end? If you don’t know, you haven’t watched enough horror movies. The Guard from Underground is a low-budget affair, but so were the majority of mid-80s slasher films from the United States. As such, I feel it counterproductive to criticize the film’s low production values. The real crime here is that Kurosawa doesn’t contribute anything new to the genre. Dim lighting to the point of zero visibility and a cheesy, bombastic soundtrack are what pass for mood and atmosphere in this film. And aside from an amusing use of a locker to commit a homicide, the kills in this film are pedestrian at best. It also doesn’t help that the security guard is the most straightforward homicidal maniac you’ll ever see in a slasher film, complete with no motivation, no backstory, no connection to his victims, no mask/disfigurement - in short, no charisma whatsoever.